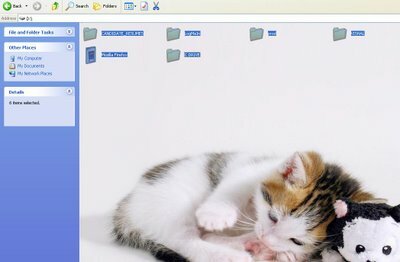 How to Customize folder background in Windows XP! Home Quick Tips How to Customize folder background in Windows XP! In Windows 98, there was the facility to Customize folder background, image, fonts, folder background etc in any folder but this feature was removed from Windows XP. Today i am writing a simple tutorial which will explains how to add a background image to any folder in Windows XP. Step 2: Now Within the folder, right-click and select Properties » Customize tab » Customize> Change Icon. There, choose any icon, click Apply and OK. Step 4: You can see the path to the image in the highlighted blue code in step 3. Select cool background which you want to insert as a folder backgraound. And copy the whole path along with image name. and replace it with the highlighted blue code. Step 5:Save the Desktop.ini with the modified code. And refresh the folder, you will get your favt cool wallpaper as your folder background. Enjoy…. Just Give it a try and let me know about your experiences through your valuable comments. Previous: IPL – Indian Premier League Twenty 20 Cricket Matches New Schedule! Next: How To Access Files & Folders From Your Taskbar! Is Exposure to Vaping Really Bad for Kids?